CEO Arnie Bellini laid out how ConnectWise thinks MSPs can find their path to competitive differentiation. Whatever it’s been in the past, Bellini says the future of the longstanding ConnectWise community is in enabling the evolution and improvement of the world, what he called “a huge construction project where we are building a better future.” MSPs will need to specialize, be laser-focused on customer service and stay ahead of the technology curve in order to differentiate themselves. ConnectWise believes the road ahead is built around three milestones. 1. As-a-service. From printing to collaboration to security, every technology you can think of will solely be delivered as a service in the future. Bellini told the audience that in 2016, worldwide managed services spend hit $83.6 billion, with the bulk residing in managed help desk, SaaS and print. By 2021, it will be a $154.5 billion opportunity, and managed security takes the lead. Demand for expertise is high, capabilities are expensive to build and the efficiency of managed service providers is hard to beat with in-house teams. The kicker to an as-a-service ecosystem is that the customer is in complete control. Every month, an MSP has to convince a customer that they’re getting the value they’re paying for. It’s the channel partner sitting smack dab in the middle of the customer-solution provider relationship, and that’s a big opportunity. 2. Business Maturity. In 2003, Arnie Bellini himself came to a farm outside Harlan, Iowa and hooked up ConnectWise for Arlin Sorenson’s agriculture-focused managed services practice. The two have worked together ever since. Just a few years earlier, Sorenson had founded HTG Peer Groups, which ConnectWise bought in January. HTG is now IT Nation Evolve and continues to focus on helping partners through the phases of the entrepreneurial journey, from running a business on “muscle and feel” to defining and working toward a legacy for the business and its owner. Consulting firm Service Leadership, said Sorenson, reports that 70 percent of MSPs are looking to participate in a merger or acquisition in the next five years. To that end, ConnectWise is offering its partners a sweet deal. If a ConnectWise MSP acquires a company that’s using competing platforms, it will gift up to six free months of ConnectWise to ease the integration of the two companies. 3. Security. Recently, Bellini saw for himself just how big of a business cybercrime is when he visited the dark web for the first time. Cybercriminals aren’t just hackers sitting in basements; they’re organized crime, a la Oceans 11. According to Cybersecurity Ventures, cybercrime comprises 7 percent of the world’s annual economy, said Bellini, with a total value greater than the entire drug trafficking market. Between the kind of demand those numbers give rise to and the severe and growing cybersecurity skills gap, automated managed services are an opportunity MSPs can’t afford to ignore. Every time we think we’ve got technology down, Bellini told the audience, it changes. ConnectWise thinks that differentiation is all about high-quality services, but admits it’s easier said than done. Bellini recounts conversations with partners who told him that transitioning from break-fix to recurring services was so hard, it would have been easier to just open up a whole new managed-services business. But now, says ConnectWise, it’s time to take managed services out of the server room and into the realm of customer service. 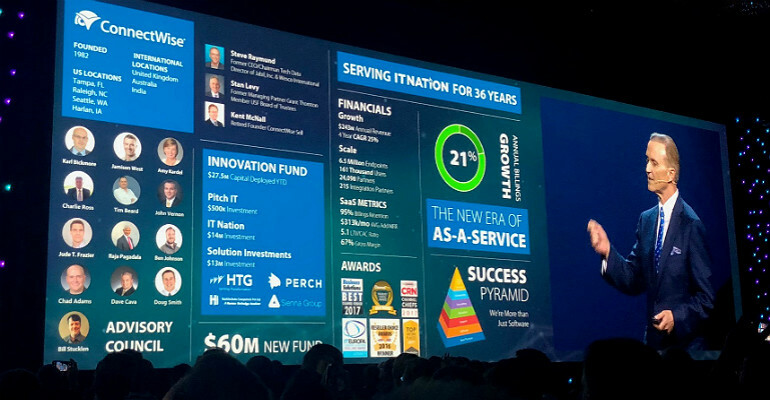 The idea at this morning’s keynote was to launch the new IT Nation, and ConnectWise executives spent hours outlining its vision at the conference’s open. In the end, it wants to offer its service-provider partners the same level of service it’s encouraging them to give their clients. To that end, the company unveiled a new highly branded portal, available in January, that gives end users the ability to monitor their IT spend and remotely manage their own devices. With a new portal, a new interface, an improved marketplace and revamped IT Nation brands, ConnectWise loaded attendees up with information to digest as they go about the rest of the conference, which goes through Friday.